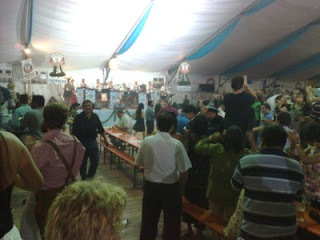 Oktoberfests are really becoming very popular. 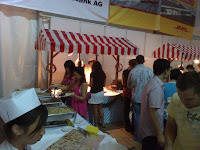 Several Clubs, Restaurants and Breweries have been adding this original "Bavarian Bierfest" since a couple of years to their event calendars. The organisers are flying in uhm, ba, ba bands to get the real atmosphere for their guests. 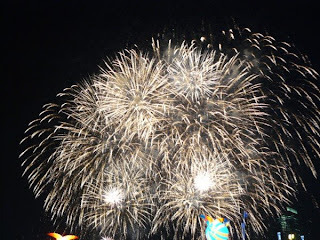 And it's not only the huge Singapore expat community that is appreciating these celebrations. 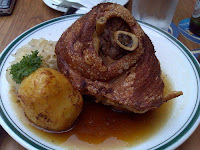 More and more Singaporeans are also getting hooked to Oktoberfest beer, Schweinshaxen (pork knuckles), Goulash, Bratwuerstel, Brezel and Apfelstrudel as desert. 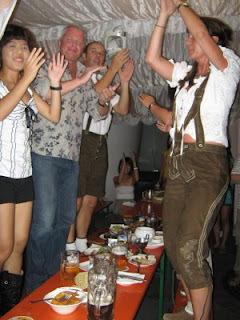 It took a while until the mostly conservative Singapore population loosened up and started standing up on benches- as demonstrated by westerners-, raising up their beer mugs and screaming out loud and with pride some funny sounding German words like: "Die Kruege hoch"(raise your mugs), "ein Prosit der Gemuetlichkeit"( cheers to cosiness) or " Oans, zwoa, gsuffa"(one, two, three drink it). 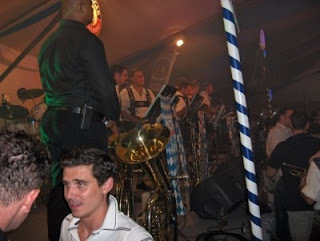 Becoming a renown Oktoberfest there are a few "musts" to make this event successful. 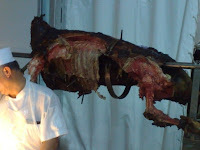 The quality of food is one of them, the other one is music. 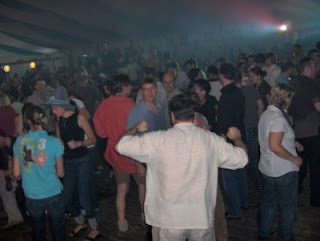 Besides the popular original Bavarian Oktoberfest tunes, the well known "Vogerltanz-bird dance" has been a big hit by Oktoberfest goers, as well as Austrian DJ Oetzi's 2 No. 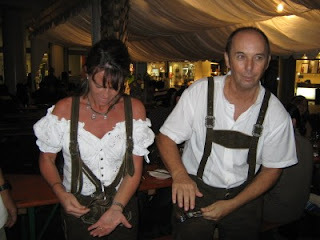 1 world hits which cannot be missed at any Oktoberfest celebration: "Anton from Tirol" and Hei, Hei Baby, I wanna know....." These 2 songs and one oldie "Alice, who the f***" usually raise the temperature to boiling levels! It's great to see when all races become a big multicultural family during such events, dance and have fun with each other. 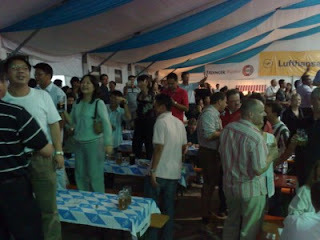 The "oldest" Oktoberfest in Singapore is held at Swiss Club since 9 years now. 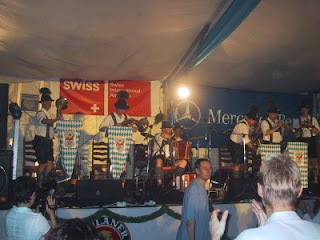 From three nights of celebration initially to for six nights over two weekends and a traditional Fruehschoppen on the last Sunday this year. 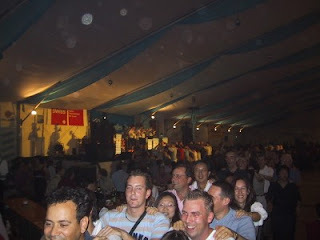 The participation grew from 2,000 guests in 2000 to more than 10,000. A record attendance! 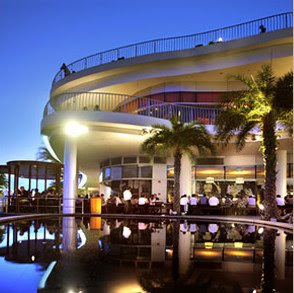 Being the biggest one in town it is very popular of course among among Swiss Club members but also with big companies because of it's enormous capacity to host their large groups of employees and guests. 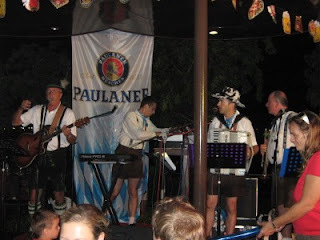 A good joice was to introduce a new band "Huettenpower" at least for the first weekend, because for many regulars 9 years of the same old band "Musikkapelle Partenkirchen" has become boring. They may be good musicians but definitely not the best singers. The food quality was great during the first years, quite disappointing the last few years but has increased a lot most probably due to Frankie, the new Chef. If someone prefers huge crowds it is definitely the place to be. Smaller Oktoberfests might be yours if you prefer it cosier with a manageable crowd. The one to point out is a new comer in town, but did not have any teething problems. 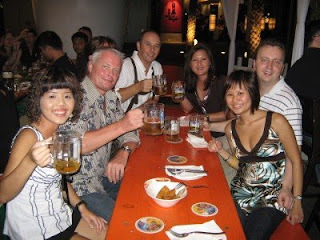 It was held within the premises of Brotzeit, a German Restaurant & Bar in Vivo City. 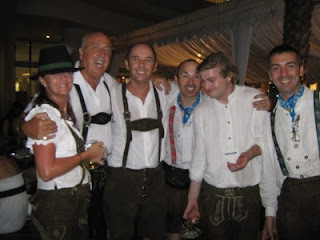 The food cooked by Austrian chef Hans and his team was delicious, so was the original Munich Oktoberfest beer from Paulaner. Another hit was the Austrian band "Die Lustigen" (the funnies) because in no time the audience was in a real dance, sing and merry making mood! Thank you Sigy, Toni, Juergen, AnTon! 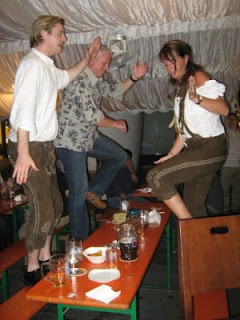 I would call Brotzeit a sleeper (secret tip) not only for Oktoberfest. 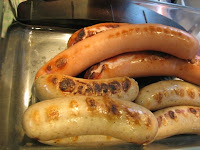 The name "Brotzeit" is a typical Bavarian expression – "Brot" being German for bread and "Zeit" for time, referring to a cozy meal complemented by fresh beer. 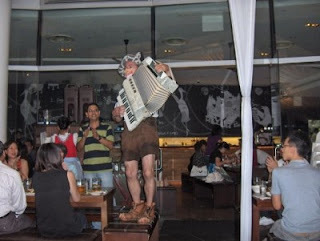 In VivoCity you can enjoy your Brotzeit (a variety German beers accompanied by authentic Bavarian cuisine) al fresco by the seaside with an unobstructed view of the harbor and Sentosa island or in their new open concept bier bar & restaurant down town in Raffles City. You won't regret it. Check out their website for details. Guess where Bretzel and some bread comes from? You don't have a life line!! Time to celebrate our 10,000 blog visitor!! Its a great day for our small niche blog since we reached the 10,000 mark, which we never dreamed it would happen. Thank you all for checking out website and patronizing Erich's Wuerstelstand and Backstube. What is wrong with Luca di Montezemolo the Ferrari Boss? Is he a sore loser and therefore blaming the Singapore Grand Prix? He is calling Singapore well enough for the circus but not for a F1 race course? Well then, no circus is perfect without clowns and your team were the best clowns any circus could wish for. I also didn't hear any kind of comments the night before after Massa got "pole" and Kimi finished second?? Means the track changed over night into a circus arena only? But thank god most of the other teams and media including Berni Ecclestone, who are praising Singapore for the great job they did to get this almost perfectly done. Dear Mr. Montezemolo please bear in mind that your politicians during the reign of the Roman Empire were the one who started this "Panem et Cricenses- Bread and Circuses or Bread and Games" for your people when they sent gladiators into the "colosseum" to fight against themselves and wild lions to keep the folks happy. Isn't nowadays sport a modern version of the same old and the gladiators are drivers in F1 or similar sports, Roger Federer and Nadal in Tennis and so on and so on? F1-, Tennis-, Ski- Circus that's what these teams travelling around the globe to pursue their respective sports called by media and fans, isn't it? So what definitely is your problem with our race track? Why do you throw stones sitting in a glasshouse yourself with lousy performances of your engineers that are not even able to operate two buttons (green and red light) correctly? Blame yourself for the mistakes and not race tracks. If your company is a good as you think they are they should do their homework to be best prepared for the races. Which don't you Sir not blame other courses, they are not flawless as well. We do admit that there is place for improvement, that there are teething problems. We can take criticism and are ready to listen, learn and improve. However we are only taking it from people who can give positive feedback and not just generally criticize. But maybe Singapore this tiny island somewhere in China (?) or Asia- who knows?- is an easy pick because with only 4.6 million people the market is just too small, too neglect able for the Fiat group. The ratio of inhabitants and Ferrari owners is quite high though. To all Singapore Ferrari supporters think about it twice if you still want to cheer for a company that belittles our beautiful city state and calls it a circus!! There are better teams worth cheering for out there in “The Formula One Circus“. On the other hand we may be should thank Montezemolo because as it is being said even a negative press is better than NO press and it makes Singapore more interesting for people to check out. Next year there will be definitely no Ferrari car on our blog! I know, not that you would care Mr. Montezemolo. 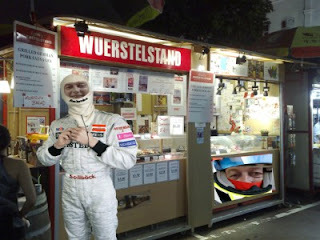 Erich's Pitstop will close till next year's Grand Prix and we want to thank you for stopping and refuelling with us. The Wuerstelstand however is open again. It's business as usuall. Erich and his team will be happy to serve you.